Mix the meatball ingredients (everything except the Rolls and Tomato Sauce) in a large bowl to combine. Grab some of the meat mixture and wrap it around one of the rolls. Roll around in your hand to seal tightly. Bake meatballs at 350°F for about 30 minutes until browned and cooked through. If any cheese starts oozing out, they are done, get them out of the oven quick! 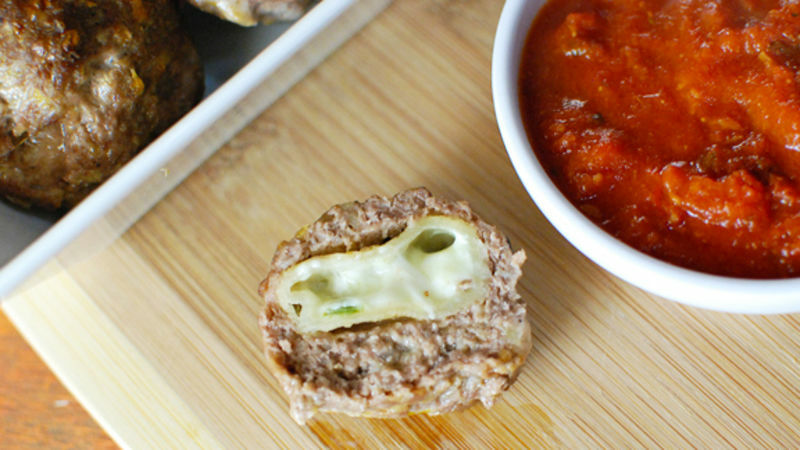 Stuffing meatballs is fun, but it can be hard because meatballs are so small. It generally goes one of two ways. Either the filling is too big and the meatballs end up large and very fragile, or the filling is too small and you don’t even taste it. These meatballs are an exception to the rule and will come out perfect every time. They key is that you're stuffing the meatball with something that is already stuffed, so the cheese is easy to manage and not falling everywhere or trying to escape from the meatball. You also don’t need a huge layer of beef around it to hold it in. Make these for the next football or playoff baseball game – your friends and family will love this unique meatball/jalapeno popper crossover! Get started with a simple meatball mixture. Then just wrap the meat around the jalapeno bites. Line them up on a baking sheet and cook for about 30 minutes. Keep an eye out for exploding cheese, and if you see any, it’s time to take them out. One or two of the meatballs will probably crack like this, but it’s not a big deal. They are the ones for the chef to taste and make sure everything came out okay! Serve with some tomato sauce. Allow these to cool for a few minutes before serving so the molten hot cheese doesn't burn your guests. Dan Whalen made a meatball sub with the leftovers. He has been blogging for over 5 years at The Food in My Beard; check Dan's Tablespoon profile often to try his recipes with creative international spins!